We had great news a few weeks ago — our team was selected as a winner of the HUD Rebuild By Design competition, and New York State is being awarded $60 million to build out our project — Living, Growing Breakwaters off Staten Island. Kate Orff and her team at the SCAPE design firm built the team and led the effort, and it was an honor to get to be a part of it. For the final review, teams were asked to make videos, and here is the one by our team – it keeps getting positive reviews, so is worth sharing far and wide. In it, we explain many of the innovative aspects of our living growing breakwaters, as well as our approaches to stepping down risk instead of falsely hoping to eliminate it, making the hazard more visible and making urban coastal communities more resilient through education and interaction with the ocean. I recommend watching the video, but in case you would like to read, the transcript of my statements on coastal flood adaptation and how we used ocean modeling to test our breakwaters follows. The layering of coastal protections is important because sometimes one protection type such as a levee can fail or be over-topped. It’s better to have multiple, layered protections and that can come in many forms. Having an ecological approach, one case would be to have large expanses of oyster reefs or wetlands that can reduce the flooding before it reaches your seawall. We were reminded by Sandy that this region, northern New Jersey and New York City, is susceptible to being hit by a hurricane, which hadn’t happened in over 100 years. And so we were reminded that we have to deal with this issue sooner than we realized with sea level rise and natural storm surges that don’t even necessarily have to do with climate change. In the case of the storm surge, Raritan Bay is in a bad location, and Staten Island is very vulnerable to storm surge because it is in more of a funnel shaped area where the storm surge comes in and it actually gets larger as it comes into the point of that funnel. Modeled peak water elevations during Hurricane Sandy in meters above mean sea level. With Sandy “captured” by the computer model, we can run experiments on the storm, testing how different adaptation strategies can impact flooding and waves. A benefit of computer models is that they synthesize all scientific understanding of coastal storm surge and waves and they give us an objective answer. Many people have an opinion or even political viewpoints driving what they think we should do about coastal flooding and sea level rise, but the benefit of computer models is that they give us an objective answer based on the best available science. In terms of risk reduction, the goal of the breakwaters is only to reduce wave impacts at the coast, not to stop storm surge, and it leaves the choice of what is done at the coast (e.g. dunes, raised berms) to the Corps and local communities. 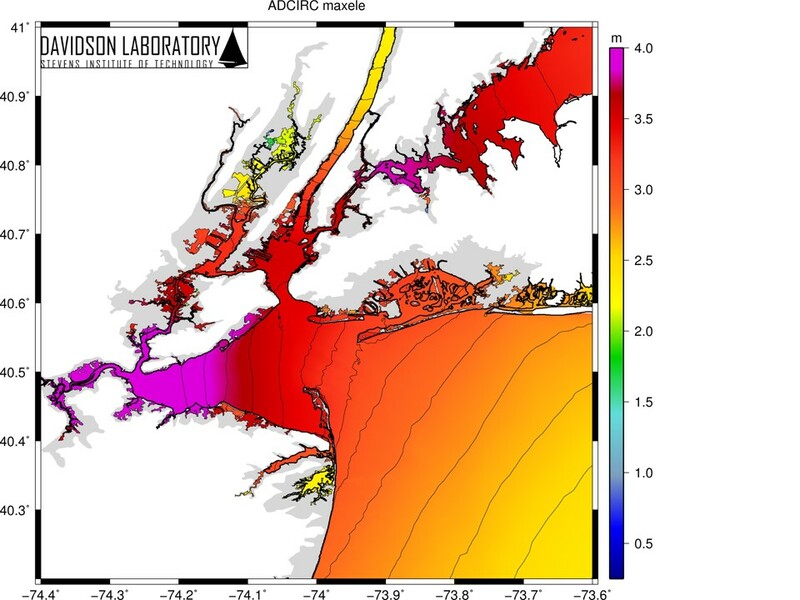 The model results show an up to 4 foot reduction in wave height at Staten Island’s shore (during a Sandy-like storm), which could ultimately reduce erosion during winter storms, make the coastal areas safer during more extreme storms, and reduce the FEMA V-Zones and Coastal A-Zones. Risk reduction doesn’t always have to come in the form of vertical walls. This entry was posted in security, water and tagged coastal, education, flood, hazard, Kate Orff, Living Growing Breakwaters, modeling, oyster, reef, resilience, risk, SCAPE, Staten Island, stepping down, storm, surge, Tottenville, urban, waves. Bookmark the permalink.